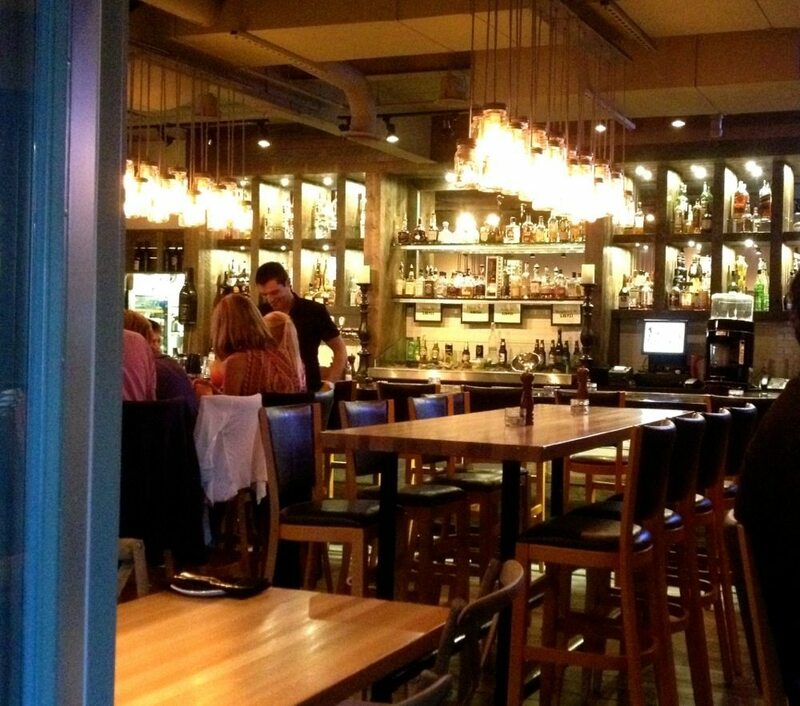 After what seemed to me to be a rocky start, culinarily speaking, Rosie’s Southern Kitchen and Raw Bar, which opened in December 2013, appears to have settled comfortably in the southern bit of the Glebe. The restaurant (its sister is the Big Easy on Preston) has positioned itself, pretty cleverly, just north of the massive Lansdowne Park development in the former home of the original Mexicali Rosa’s (from 1979). Where there used to be parking, is now a likeable outdoor patio, complete with a come-hither fireplace, thoughtful wind blocks, funky vintage-y fans, and great lights. It’s a great place to be on a fine night. Inside, the room is dominated with wood, tables are both high and low top, while most of the visual drama takes place above our heads, with chandeliers of clustered jars stuffed with Edison bulbs. The oyster/booze bar is zinc-topped, leggy, and lovely. During my visits, the room was loud and full, and while there are TV screens, they didn’t dominate. When it opened, and upon my first visits back then, the food was largely unimpressive. Didn’t seem right to complain about a fun new neighbourhood place with southern comfort cooking, but the dishes I tackled — with the exception of the raw oysters and fried calamari — were decidedly mediocre. I gave it a few months and returned. Quel difference! The menu has shrunk considerably, and the food has risen a considerable notch. Dishes were more daringly plated and southern flavours decidedly more pronounced. 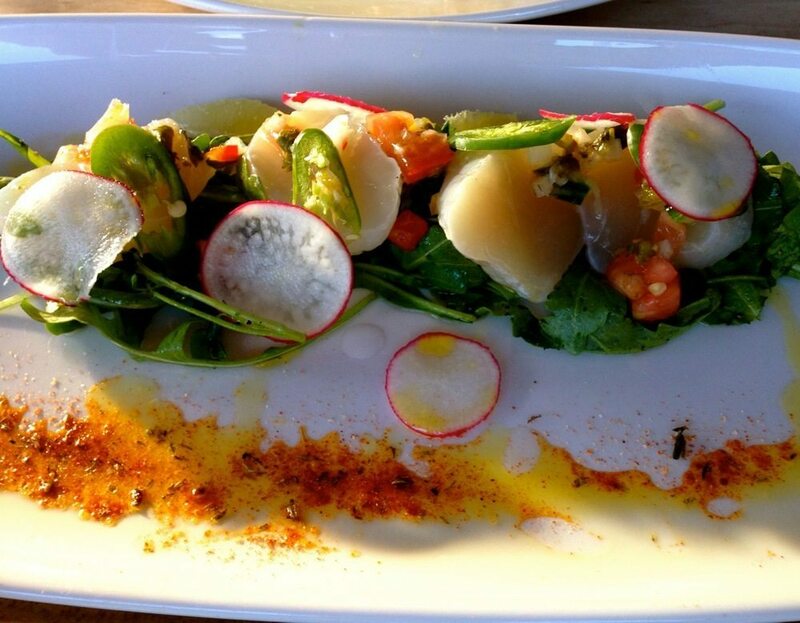 Diners should be aware there’s some serious heat in the scallop ceviche salad. Here the raw scallops are served in fat juicy disks rather than the usual thin slices, and plopped on a bed of superior greens, with rings of jalapeño and radish, and carefully sectioned lime. 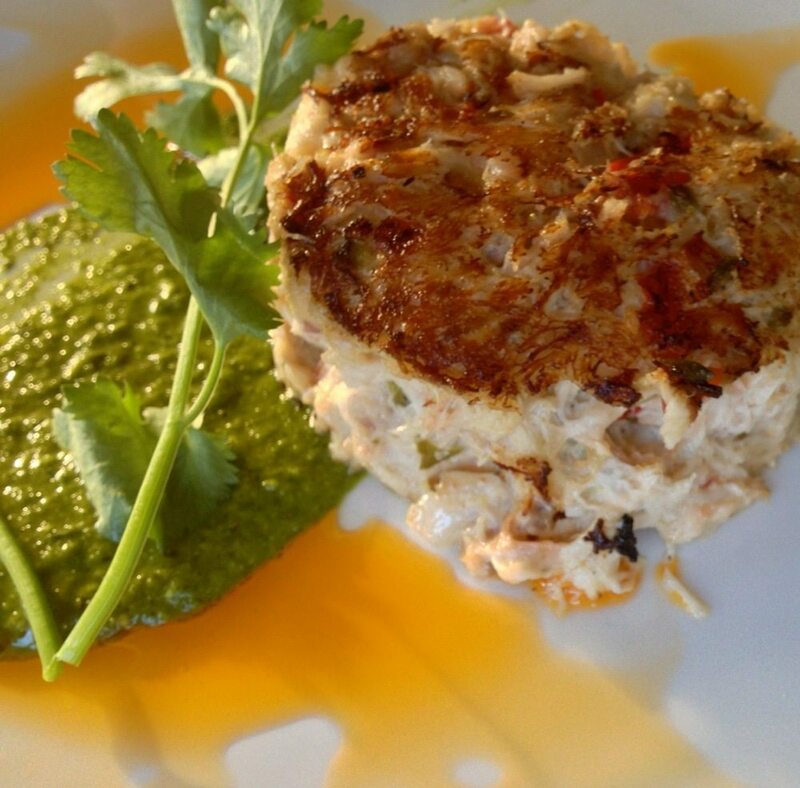 The crab cake was a terrific rendition, the meat untainted with iodine, left in large, lightly-packed chunks, beautifully seasoned, lightly fried, and served with a powerfully green chimichurri featuring cilantro. Full marks. A small salad of heirloom tomatoes and cucumber dressed well and served with a likeable guacamole felt a tad overpriced at $12 bucks, but still, it was pretty on the plate and lovely to eat, and if the quantity were bumped up a bit, the salad would make a fine lunch. 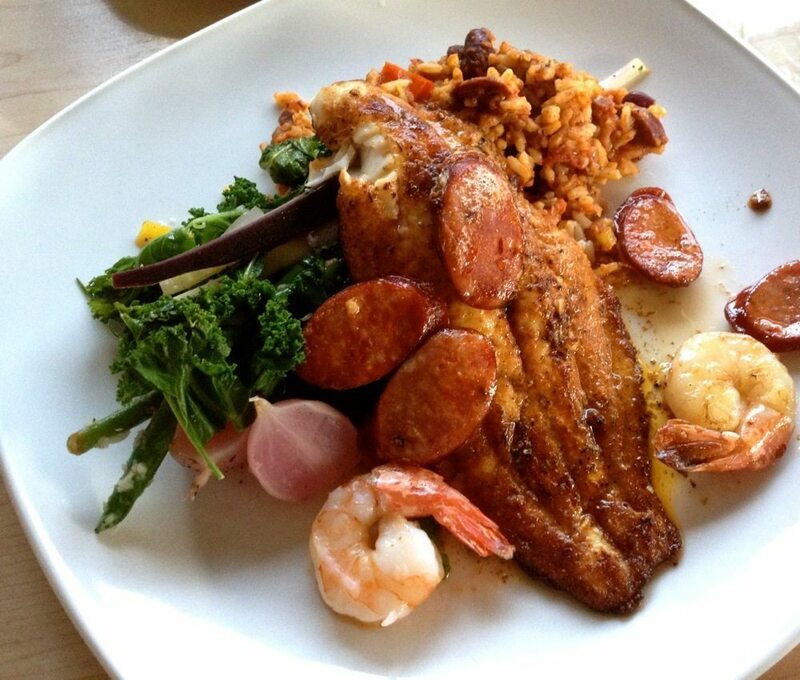 Ribs were tender and meaty; the blackened catfish properly spicy and cooked, topped with juicy disks of chorizo, a few unseasoned shrimp, and served with well seasoned Mexican rice. The only real disappointment was with the pork chop. It arrived overcooked, grimly grey, though supported with a fine Bourbon apple sauce, chunky and perfumed with thyme and cinnamon. We loved the fried potato dumplings, though the pile of vegetables — heirloom carrots, green beans, braised radish, baby kale — looked more promising than they ate, injured by a heavy hand with (what I suspect is jarred) garlic. The chocolate pecan pie was perfect, though the whipped cream was icky sweet… but so what. At Rosie’s, there’s much more right than wrong now.